Thank you, Giada, for once again sharing a beautiful, seasonal vegetarian pasta recipe that I can easily veganize. These kinds of recipes are incredibly smart: not only are they healthy, they're budget-friendly and if you're only making them for one or two, will last you throughout the week. 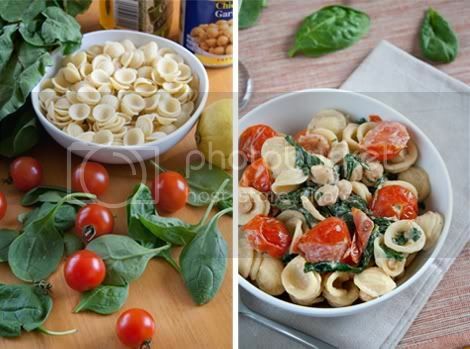 Orecchiette with Greens, Garbanzo Beans and Ricotta Salata couldn't be easier to take from veg to pure veg. I mixed up a quick tofu ricotta cream sauce to use in place of ricotta salata, and really turned this dish into something extra-special. 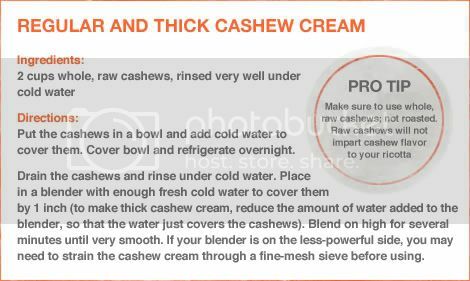 I tend to keep raw cashews soaking in the refrigerator all the time — it literally takes minutes to whip up some cashew cream to use in any kind of "cream" or "cheese" sauce your heart desires. Make the Tofu Ricotta Cream Sauce: Place all of the ingredients in a food processor or blender and blend until creamy. 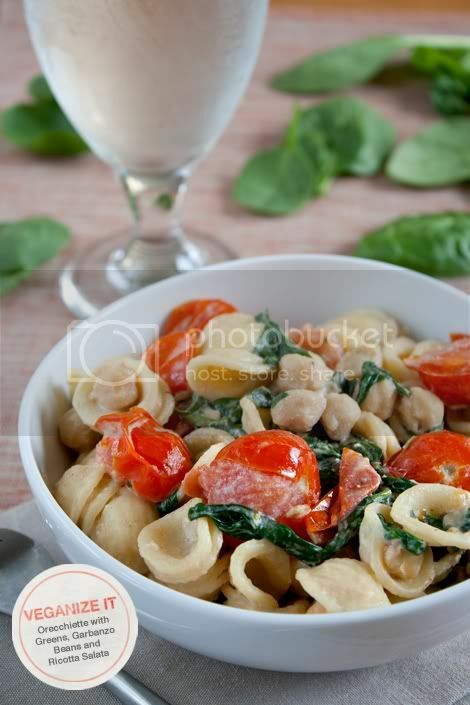 Prepare the Pasta: Bring a large pot of water to a boil over high heat. Salt the water generously. Add the pasta and cook, stirring occasionally, until tender but still firm to the bite, about 11 minutes. Cook the greens, beans and tomatoes: Heat the oil over medium-high heat in a large skillet. Add the garlic and cook until fragrant and lightly browned, about two minutes. Use a slotted spoon to remove the garlic and discard. Add the Swiss chard and cook until wilted, about five minutes. Add the spinach in batches and cook until wilted, about five minutes. Add the beans and tomatoes and cook for about five more minutes. Turn off the heat. Drain the pasta, reserving about 1 cup of the pasta water. Return pasta to the cooking pot and add the tofu ricotta cream sauce. Toss well. If needed, thin out the sauce with a little pasta water and season with salt and pepper. Transfer to a large serving bowl. Serve.